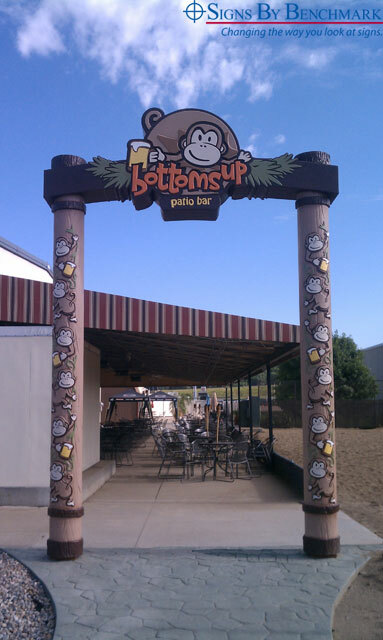 When Avery Brothers Sign Company of Sioux City, Iowa received wayfinding sign designs for the bottoms up patio bar, their staff knew just what to do. 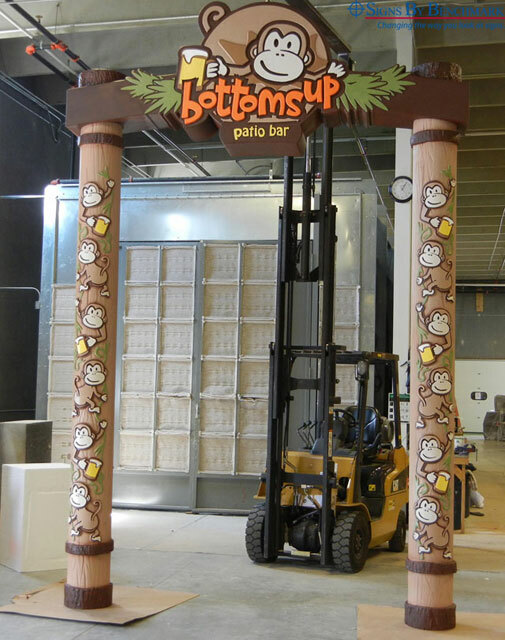 “As soon as I saw the design, I told the team that Signs By Benchmark would be the only sign manufacturer that could do the job,” said Ryan Avery of Avery Brothers Sign Company. 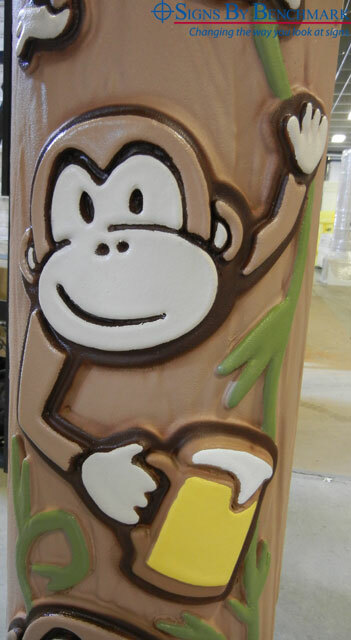 Avery made the decision to call Signs By Benchmark because he knew that the flexibility of its cellular plastic medium would perfectly lend itself to the required fine sculpting and embossing. 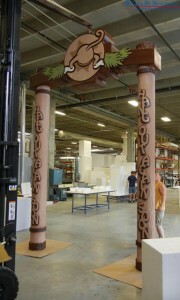 He also knew that Signs By Benchmark craftsmen possess the skills to bring the whimsical sign to life. 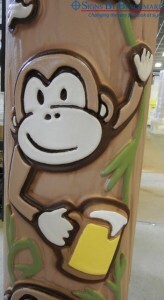 Working from designs by J.D. Gordon Design (Sioux City, Iowa) and poles supplied by Avery Brothers, the Signs By Benchmark team created double-sided pole covers and a sign top featuring the end customer’s playful monkey mascot. The 15′ 8″ high x 10′ wide pylon sign has no problem pointing the way to the bottoms up patio bar. Over the years, the Signs By Benchmark creative team has carved their reputation by creating custom products that can’t be found elsewhere or are difficult to manufacture using traditional materials. 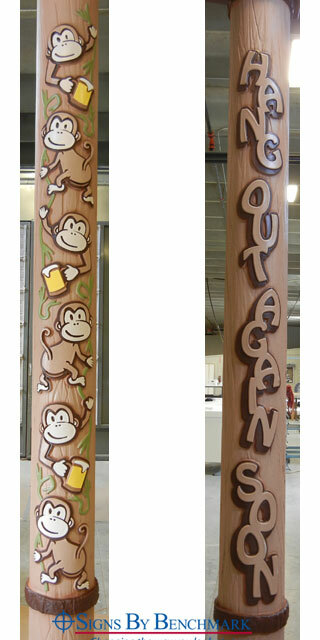 The strength, durability and long-lasting qualities of their medium and signature hard coat open the door to a whole new world of custom signs and satisfied customers. 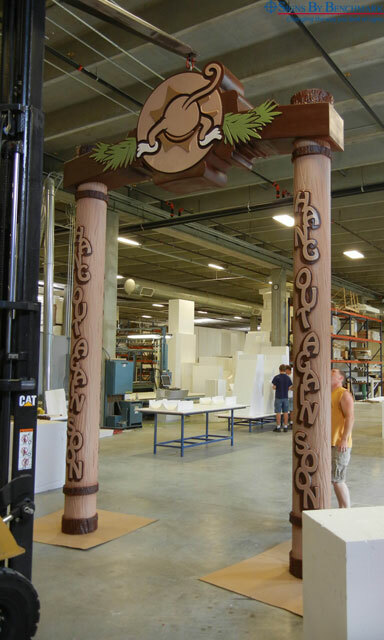 Give the Signs By Benchmark team a call at 605-886-8084 or 800-658-3444 about your next project, whether it’s a custom design or a standard monument model. Present your own design or simply tell them about your ideas then allow their designers to go to work on behalf of you and your customer.